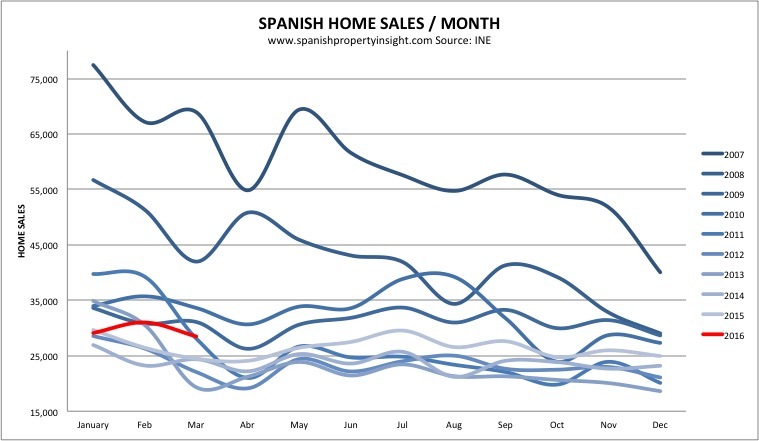 The Spanish housing market expanded by 16% in March, but growth was below average in areas popular with British buyers, perhaps due to fears of a ‘Brexit’. There were 28,492 homes sales recorded in the property register in March (not counting subsidised housing), 16% up on the same month last year, according to the latest figures from the National Institute of Statistics (INE). In total, including subsidised housing, there were 31,925 sales in March, up an annualised 17%. Subsidised housing was about 11% of the market in March. In terms of sales, it was the best March for five years, though it still leaves the market almost 60% smaller than it was in March 2007. As the next graph illustrates, it looks like the market is starting to recover in volume terms after four years bumping along the bottom. Year on year, resales were up 25%, and new home sales down 7%. The rate of decline in new home sales appears to be slowing down (though the fall in March was bigger than February) and might be a sign that collapse in new home sales is drawing to a close. Year-on-year, sales grew the most in Las Palmas (Canary Islands), up by 45%, followed by Cadiz province, home to the Costa de la Luz, up 43%. However, it is interesting to note that sales growth was below the average in all the areas most favoured by British buyers, with the exception of the Balearics (+24%). Sales in Malaga province, home to the Costa del Sol, grew by 13%, Murcia was up 9%, and Alicante province, home to the Costa Blanca, was up by just 2%. Alicante is the number one destination for British buyers. 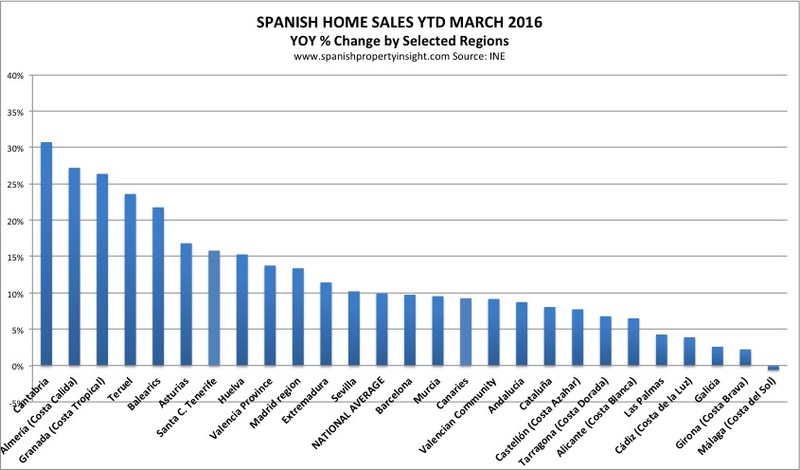 Year-to-date (3 months to the end of March), sales are actually down in Malaga province, by 1% compared to the same period last year – the first time that has happened for several years. 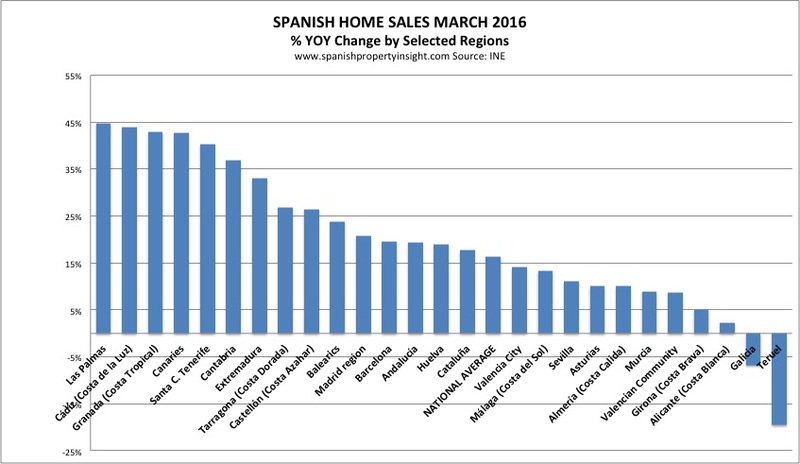 In Alicante province, sales are up by only 7%, which is below the national average. Why the lacklustre performance in Malaga and Alicante? Personally I think it has something to do with the British referendum on EU membership, with fears of a ‘Brexit’ result driving down the pound and encouraging potential British buyers to wait and see what happens in June. 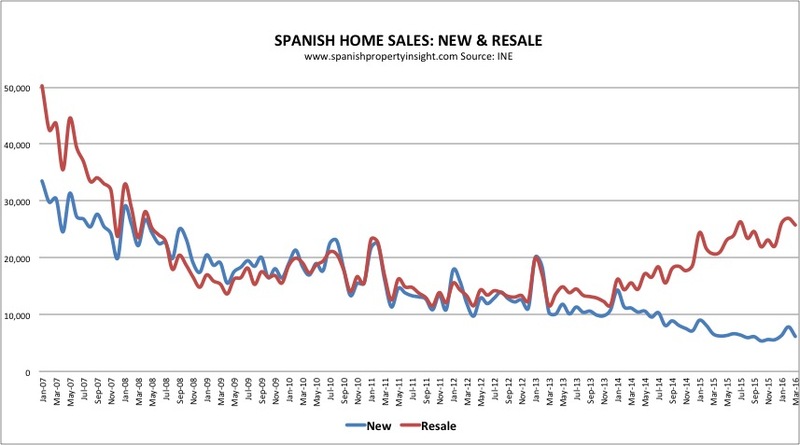 You can read more about the potential impact of the British referendum on the Spanish property market here: UK EU-referendum implications for Spanish property market.